GUILDERLAND — Over 100 animals will be available for adoption, for little to no cost, at The Animal Hospital in Guilderland on Saturday. “People are giving up or abandoning a record number of pets because they can’t afford them, and, by the same token, people aren’t stepping up to adopt pets because they can’t afford them,” Becker told The Enterprise this week. Becker, who founded The Animal Hospital over 30 years ago, has a reputation for working with wildlife, and this will be his first foray into domestic animal adoption. He contacted Caporizzo, whose Pet Connection program The Animal Hospital sponsors, and asked for help organizing an adoption event. “If I could do anything to facilitate adoptions, which would help the agencies, and ultimately the pets, I wanted to do it,” said Becker. Caporizzo contacted agencies he had worked with through Pet Connection; the goal was to get at least eight agencies to participate, but there was such a positive response that 14 agencies will attend. The Animal Hospital will subsidize the adoption fees. One agency that will be bringing adoptable pets to The Animal Hospital on Saturday is the charity group The Animal Support Project. According to Melinda Plasse, the founder of TASP, the group, consisting of roughly 25 volunteers, has been actively rescuing “animals and people” for five years. “We’re a little different than the typical animal rescue group; we do pull animals from shelters and re-home them, but our primary mission is to short-circuit the need for animals to go to the shelter in the first place,” said Plasse, who lives on a farm in Cropseyville. TASP offers help with behavioral issues, landlord problems, legal issues, veterinary care, and disaster aftermath. Plasse said she founded the organization after she traveled to the Gulf Coast as a volunteer to help deal with the aftermath of Hurricane Katrina. She came back with many contacts, and did some training with national groups to assist with national-level rescues. “What I learned was easily transferable to the local community. 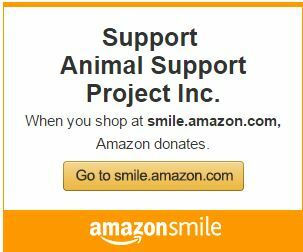 If you can take care of 350 scared animals after a hurricane, you can certainly help someone with one dog,” Plasse said. Her philosophy is that neighbors should help neighbors keep their pets. “Neighbors help neighbors when another family member is sick — why wouldn’t we do that for someone who loves their animal?” asked Plasse. TASP offers its services to everyone on a sliding scale according to need. Plasse said anyone who can prove financial need is eligible for free services. “We are here to get people through a crisis,” Plasse said. TASP delivers flea, tick, and heartworm medication to low-income families at reduced costs, and helps subsidize operations to spay or neuter pets. Plasse said TASP will have a large tent with plenty of information and adoptable animals at Saturday’s event. “There is no shortage of animals that need a home. We get referrals from veterinarians about pets that need new homes, and we take animals from shelters down South,” said Plasse. 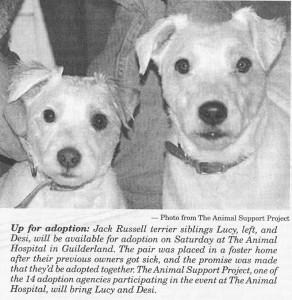 Two of the dogs TASP will bring on Saturday are Jack Russell terrier siblings, Lucy and Desi. They were put up for adoption when their previous owner became sick, and could no longer care for them after her husband died. Before his death, he made his ailing wife promise that Lucy and Desi would stay together when they were adopted out. The terriers are both six years old, and Desi is deaf, but with Lucy’s help he gets around just fine. The pair is currently in a foster home. Plasse said TASP is thrilled to be included in the adoption event. Other adoption agencies participating include Animal Lovers; the Animal Protective Foundation; Brennan Humane Society; Cat Tales Rescue; the Companion Animal Placement Program; Greyhounds as Companions; the Guilderland Animal Shelter; Heaven Sent Rescue; Kitten Angels; the Mohawk Hudson River Humane Society; Peppertree Rescue; and Rottie Empire Rescue. Becker said many local businesses have offered to sponsor the adoption day and to provide refreshments and gifts. Bountiful Bread and Creo’ will provide lunch, and there will be drawings for gifts, such as a $100 gift certificate for boarding at Altamont Country Kennels. All proceeds will go to the Pet Connection. For those who adopt pets on Saturday, The Animal Hospital will provide a tote bag full of pet-related items, and a $75 gift certificate for health-care. Professional portraits of adopted pets will be taken free of charge, and the Grooming Gallery will be on site to provide grooming to the pets in need. “People can just show up, and hopefully at least look, and, even if they don’t need a pet, they might know someone who does,” said Becker. The event will run from 10 a.m. to 3 p.m. on Saturday, Aug. 14, at The Animal Hospital on Rocking Horse Lane, in Guilderland.